On deck today is a very cool looking tactical boot knife, the Smith and Wesson SWHRT1 Tactical Boot Knife to be exact. Before I really get into the details of the knife, I just have to comment about the blade shape which I think is very unique for a boot knife. S&W calls it a “Wharncliffe” style blade. What we have here resembles more of a skinning knife than the traditional “dagger” style blades we see when we think of boot knives. Really I think that is what makes this a good EDC type blade. The blade itself is made of a single piece of black teflon coated 440C with black zytel scales. The blade is 3.9″ with an overall length of 8″ and a weight of 4.8 ounces. Very solid construction, solid tang, all black for a very “tactical” effect. One issue people have pointed out with this particular knife is the sheath. They really like the knife but they say it’s very hard to remove the knife from the sheath. My advice would be to hit the sheath with a heat gun and jiggle the blade around a bit. That should open the retention up a bit and let you draw the knife with less effort. I think that would lend to a utility blade draw. If you are taking this knife out in the woods (camping, hiking, etc…) I would leave the sheath as it is, as you want some good retention so the knife doesn’t accidentally fall out on the trail. At any rate, I wouldn’t let the sheath be a deal-breaker with such a very cool, very unique looking blade. Where Can I Buy the S&W SWHRT1 Tactical Boot Knife? 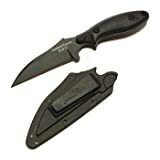 You can buy the the SWHRT1 Boot Knife on Amazon. Click here to buy the S&W SWHRT1 on Amazon. Where Can I Read More Smith and Wesson Tactical Boot Knife Reviews? The best place for more reviews of the S&W SWHRT1 from people who own the knife is Amazon. As of now there are over 15 reviews to consider. Click here to check out all of the S&W SWHRT1 reviews on Amazon. I personally like this blade shape, it’s good for “detail”-type work and it’s easy to sharpen too. Kind of a strange choice for a boot knife, though, which I’ve always seen as being more of a defensive weapon than an EDC-type blade and that said, I think I’d want a dagger or spear-point blade if I needed it for defense. Still a pretty cool little blade though and S&W definitely makes a good knife for the price. Yeah man, these are budget options – really old reviews honestly that that I should probably take down, but the SWHRT1 gets the job done. Keep it in your boot or in your pocket, it’s a little fixed blade for when you need one. Thanks for readin man and leaving the nice comment.